After one last meal at our favorite restaurant, Alma y Mani’s, we left Todos Santos. A few kilometers later we crossed the Tropic of Cancer. Crossing the Tropic of Cancer felt like a real milestone in our southbound journey. We’d seen it on the map, but it always felt so far away. From the time we left our home in Arizona to the time we got here took us nearly four months. After crossing the Tropic of Cancer we turned onto a dirt road heading into the Sierra la Laguna Mountains, making several turns as we rode deeper into the foothills. The roads were in great shape so we managed a typical day’s kilometers in just a few hours. We found a great place to camp, with a view of the ocean, and watched the sun set as we settled in for the night. The next day started out pretty easy. We filled our water bottles at a stream crossing, and had a long second breakfast, before the route began climbing more and more steeply into the mountains. After a couple of hours of uphill, downhill, and pushing our bikes up steep roads we stopped for a midday snack, just in time to be greeted by a herd of goats that seemed very perplexed by our presence. They just stood there, for a very long time, before deciding to turn uphill to avoid coming too close to us. We climbed further up the mountains, pushing our bikes for what seemed like forever. We stopped to rest in the shade of a huge fig tree. Near the top of the pass there was a major landslide that had left large boulders in the road, and washed out other parts of the road. It was just a short bit, but it took almost an hour to get our bikes through it. The other side of the pass was in much better shape, making for a fast downhill to a beautiful place to camp with a view of the Sierra la Laguna Mountains. The next day we rolled into Santa Anita, at the outskirts of San Jose del Cabo. We resupplied, then continued east, heading up into the next set of mountains. The track was sandy, but mostly rideable, until after Palo Escopeta where we pushed our bikes through deep sand for a long time before joining good mountain roads. We found a place to camp, high on a ridge, with a view of the Sierra la Trinidad mountains and the Pacific Ocean at the end of the Sea of Cortez. 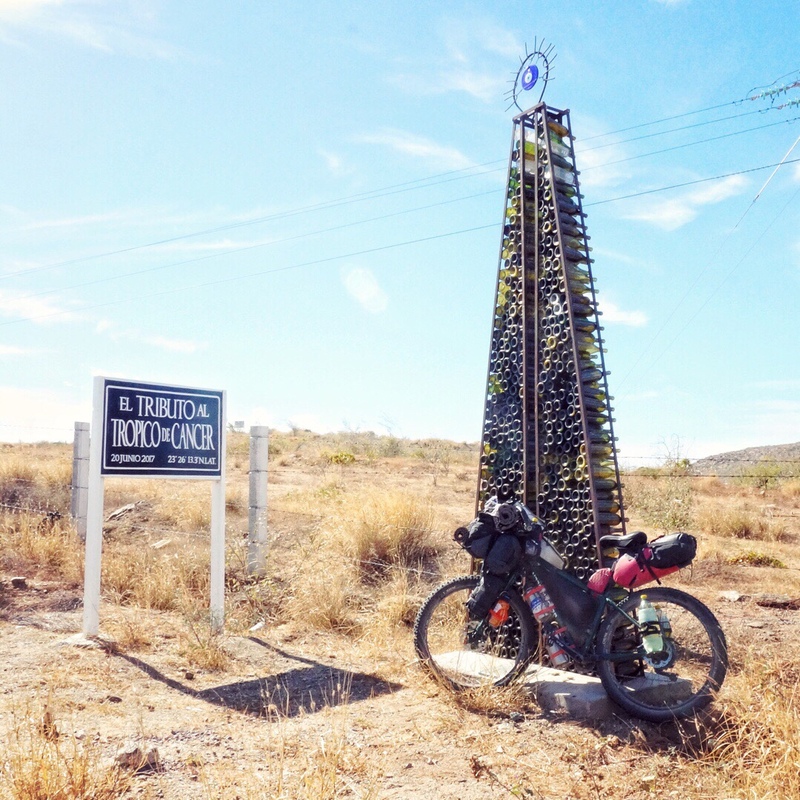 We shared some wine and chatted about our ride, all the places we’ve been, the things we’ve seen, and how special the Baja Divide route is… we were feeling it all coming to an end. And what a way to end it, finishing with the cape loop, so much green, friends, time in the mountains, and hanging out on beaches. The next day brought more climbing with hike-a-bike pushing up the steeper hills, an amazing sinuous ridge ride, and then several kilometers of deep sand before we made it to the coast on the sea of Cortez. Our friends from Maryland were waiting for us in Cabo Pulmo when we arrived. We spent two full days in Cabo Pulmo relaxing, walking through the hills, looking for critters in the tidal pools, and snorkeling.